Never has there been an outcome already decided watched by so many. Before it became past tense, The Mayweather/McGregor bout was labeled as many a thing. A meeting of styles, a clash of mouths, a battle of ideologies. What it happened to be was none of that. It was, in the words of the man bested, a whole bunch of nuttin‘. Better but not equal, or even difficult. Conor was done from Round 8 onwards. It wasn’t even a fight, it was closer to a schoolyard punch-up, the stereotypical stoush at the flagpole, where the entirety of the grade paid the weedy spectrum kid take on the alpha-bully, not to see if he could win, but rather if he could land a punch before he was knocked out. But what we expected was what happened, but slightly later than when we assumed it would. At least, in the words of The Simpsons version of Don King, Lucius Sweet, the fight when on long enough for the spectators to get drunk. We were promised three rounds, but got ten. Bonus? As a postscript, Floyd Mayweather, the demigod of domestic violence, the maven of bet makin’, takes off in his G6 entirely constructed from $100 bills en route to immortality island. 50-0. What a dude. What we witnessed today was the next level of schadenfreude reality television, ‘Who Dares Wins’ with the chance of lasting cerebral damage. Conor had no chance, as most of us publically backing for him to be shut up. Now, watching the cocky yutz get his clock cleaned is a staple of bloodsports (After all, Anthony Mundine made a career from it), but never before has the bell rung with such hopeless apathy. A ‘when’ not an ‘if’ bout. Even when Buster Douglas took down that ear-bitin’, tiger-handlin’ Phil Collins aficionado, there was a chance, and it was for something. There was shock involved. This was a protracted in-joke, a circus. At best, it was edu-tainment: If we all found the largest richest man and picked a fight, then we wouldn’t have to go to work tomorrow. 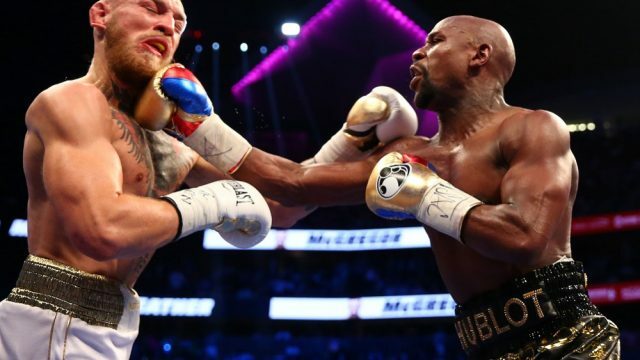 As both fighters both cashed very public checks this afternoon (Mayweather $300 million, his victim picks up a comparative third), the question is surely raised. Where to from here? 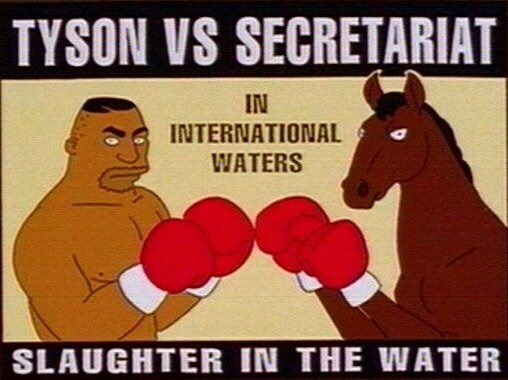 Do we step ever closer to the gormless satire that The Simpsons promised us, and see a man fight a horse in international waters, just to see what happens? Now those who defend ‘the honour of boxing’ also have an enduring romantic attachment with irony, but as one of those who paid for the privilege, I’m wondering what exactly it was that I thinned by bank account for. I wouldn’t call it charity for the rich, but it was dangerously close.